The above is from the PTR today, self-buffed, no special food or elixirs/flasks, no mods to help me keep an eye on things like latency or procs. Just me on the heroic dummy. 1) Mind Flay’s damage is showing up as a DoT. However, the crit % was within 1% on live versus PTR, so it seems comparable in that way. The average live tick, however, was a smidge over 3k. Could have just been lucky procs. 2) Vampiric Touch had 3% fewer crits on the PTR. versus live, however, its average tick was for 300 more. 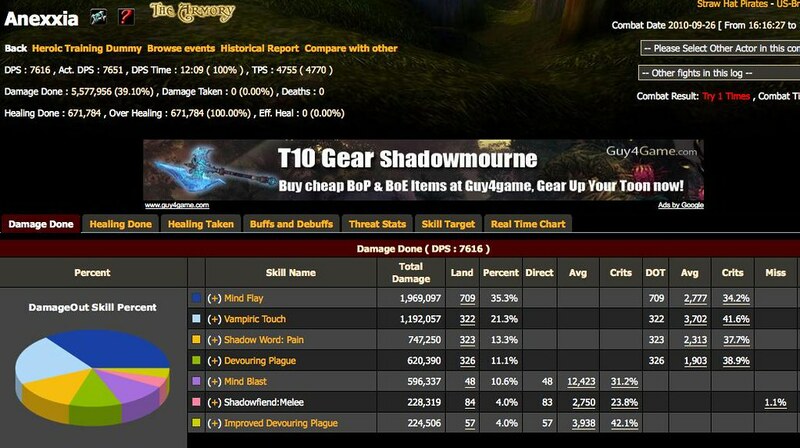 3) In live, I consistently do more overall damage with devouring plague than with shadow word: pain (13.1% vs 11.3%). On PTR this has consistently been flipped, with SW:P on top (13.3 vs 11.1). 4) SW:P has gone from 1983 a tick on average on live to 2313 a tick on PTR. That seems like a small uptick, but since you keep your SW:P up all the time with your mindflays, it adds up. Due to all the changes to mana regen, I’d been concerned about maximizing replenishment uptime. And the last time I’d been on the PTR I’d had to disperse a few times over the course of my 12min trial. But today, although I had to do that in live, I didn’t ever even dip below about 28k/32k mana. So I am waiting for the nerf bat to strike. One thing I could not really test is how much damage shadowy apparitions add to your arsenal. They’re not showing up on the logs yet as they are doing 0 damage. So they are just a pretty proc to look at for now. Overall, I am cautiously optimistic about what shadow priest DPS will bring for Cataclysm. For theorycrafting on BETA shadow priest DPS and spells, head to shadowpriest.com.